The Headless Horseman, inspired by the story The Legend of Sleepy Hollow by Washington Irving, is decked out for Halloween in his hessian gear. These boots are made for stomping! And his pumpkin is made for throwing or wearing as a substitute head. His outfit was entirely needle felted in Norwegian wool. Vince Dorse, who designed this doll (and my Invisible Man and Jekyll & Hyde), planned to have these three dolls exist as a set. So they not only share a theme and literary origin, but all three dolls share a few, key colors (red, purple and black). So, if you’re out riding through Sleepy Hollow tonight, beware. 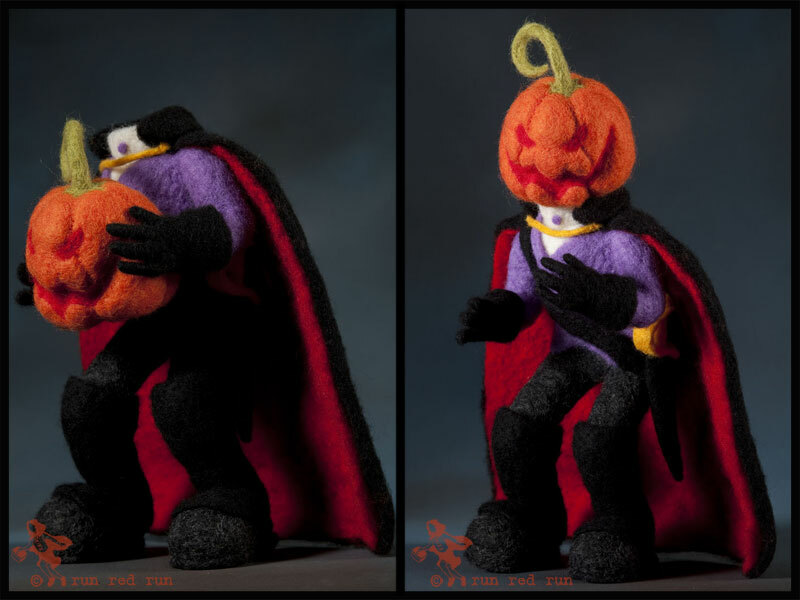 You may just have a tiny, wool jack-o-lantern hurled at your head. I’ll be posting the concept art soon so stay tuned for that. 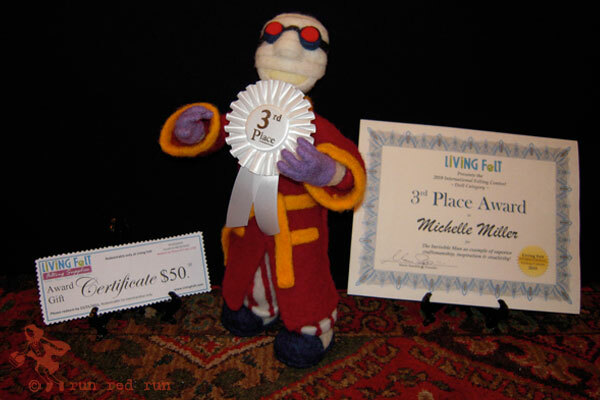 As promised, here’s Vince Dorse’s design concept for my award-winning Invisible Man feltie. 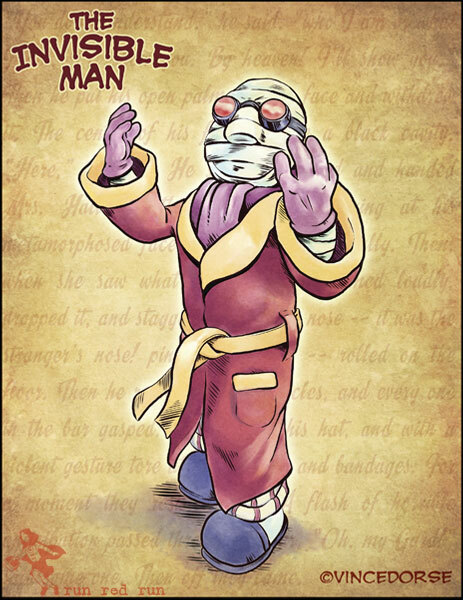 According to Vince, he was inspired by both Claude Rains’ portrayal in the 1933 movie, The Invisible Man, and HG Wells’ description of the character in his 1897 novel of the same name. If you know Vince, you know he enjoys old-timey stuff with a lot of texture and layers and “age” to it. So this doll, with its vintage feel and last-century sensibilities, was a perfect project for him. I had a lot of fun bringing this guy to life. And all those layers of clothes (and cuffs and trim and sashes) made it a real challenge. Seriously, I can’t tell you how many times I googled “ascot” to see how to felt one. In the end, I came away with a real enthusiasm for detail work and I hope to explore that more as I learn and grow with this felting thing.